Writtle University College’s Integrated Masters programme has become the only animal-first Veterinary Physiotherapy course in the country to achieve accreditation from the Register of Animal Musculoskeletal Practitioners (RAMP). Two of its other Veterinary Physiotherapy courses – the three-year MSc and two-year Postgraduate Diploma - have also been officially recognised by RAMP. The endorsement gives veterinary surgeons and animal owners the confidence that graduates from the courses are professionals trained to a high standard in veterinary physiotherapy techniques and committed to providing the best possible care to patients. Students do not have to be a human physiotherapist before studying the MVetPhys, making it an animal-first course. Caroline Flanagan, who heads up the Equine and Veterinary Physiotherapy courses at Writtle, said: “I am thrilled the Integrated Masters has achieved Accredited Education Provider status with RAMP, which is a very important piece of news for this award. “This is the first animal-first veterinary physiotherapy course in the country – and only the third course ever – to achieve this status and sets the course apart. The Integrated Masters in Veterinary Physiotherapy (MVetPhys) is an innovative four-year programme of study, which enables students to progress from a degree directly into a fourth year at Masters level. Study involves large and companion animals with a major focus on horses and dogs. The final year concentrates on the development of clinical reasoning skills for the most effective practice and exceptional professional standards. The MSc and Postgraduate Diploma – which are mainly studied at weekends - develop the skills of the student to support veterinary surgeons in the rehabilitation of a variety of species. The course also particularly focuses on horses and dogs, including supporting equine and canine athletes during competition and recovery. 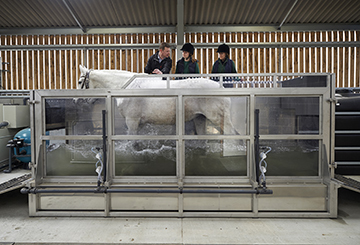 Veterinary Physiotherapy students at Writtle benefit from extensive on-campus facilities that include an equine water treadmill and a Canine Therapy Centre. Academic staff include experienced Veterinary Physiotherapy practitioners and veterinary surgeons, with therapists experienced in a range of disciplines including electrotherapy, massage, myofascial release, acupressure and mobilisation techniques. The three Veterinary Physiotherapy courses have also been accredited by the Animal Health Profession’s Register (AHPR), along with the degrees in Equine Sports Therapy and Rehabilitation, Animal Therapy and Canine Therapy. This means students are permitted direct entry onto the register when making an application following graduation.